The bold initiative by the Russian government to withdraw some of its forces from Syria is a lesson in the use of limited military means to achieve limited political ends. With the finesse of a skilled surgeon, the Russian intervention saved the Syrian government from being overwhelmed by the NATO proxies attacking it, inflicted a fatal blow to the American attempt to achieve hegemony in the Middle East, enhanced Russian prestige in the world, and demonstrated that the economic warfare being waged against Russia by the USA, EU and Canada, has had no effect on either Russian determination to choose an independent foreign policy or the military means to put it into effect. The confusion and consternation in the NATO block as they realise that, once again, they have been outwitted, is dramatic. Once again the western intelligence services have proved to be asleep at the wheel, and their government leadership mired in fantasies of their own creation. The embarrassed silence from Washington, which for months has been claiming that Russia was going to be bogged down and chewed up by the Syrian war, reflects the incompetence of its political leadership, from President Obama to the contenders for the Presidency in the current American elections. None of them know what to do, except react in frustration, a reaction that does not exactly lead to rational policies. The achievement of the limited ceasefire a few weeks ago, forced on the Americans by the reality on the battlefield, set up the logic of this partial withdrawal. The withdrawal underscores the Russian and Syrian policy of achieving a satisfactory political settlement of the war, forces the western powers to support that policy, or be declared opponents of peace, yet, at the same time, gives Russia and Syria the flexibility to respond to any attempts to escalate the violence from whatever direction they may come. The Russian defence ministry has stated that the remaining Russian air group will continue to provide air support to the Syrian forces and will continue to hit the groups that refuse to abide by the ceasefire or those determined to be “terrorist” groups, in fact the bulk of the forces attacking the Syrian people. Further the S400 air defence systems are to remain in place to cover the Russian forces remaining and to deter aggression from Turkey, Saudi Arabia or American forces. Yet, the withdrawal signals a clear de-escalation of the war and can be taken as an announcement that the enemy has been dealt a fatal blow. This initiative was taken at the same time that Russia protested any further NATO military actions against Libya unless they had Security Council approval and at the same time that it joined China in calling for the Americans to reduce the pressure on North Korea and commit to a final and peaceful resolution of the conflict on the Korean peninsular. Unfortunately, both Russia and China have joined the United States in condemning North Korea’s attempts to defend itself with nuclear weapons against the threat of nuclear war coming from the United States. 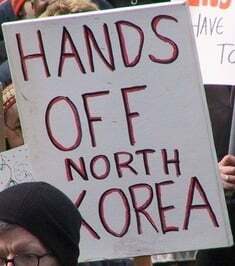 This condemnation seems to be in reaction to the fear that North Korea’s defence doctrine will provoke the USA into launching a war that will affect all Asia or, at the least, give the Americans an excuse to put new anti-ballistic missile systems into south Korea which will threaten the security of not only North Korea but also China and Russia. Perhaps they have a valid point and perhaps there are other reasons unknown to us that prompted them to join in the virtual blockade of North Korea, but the injustice is blatant. All three nuclear powers are enhancing and building their own nuclear weapon systems; Saudi Arabia is making noises that it has nuclear weapons, along with Israel, without any reaction from the big three; and the government of North Korea is being threatened with continuing military exercises that threaten a immediate decapitation strike of its government and nuclear annihilation. 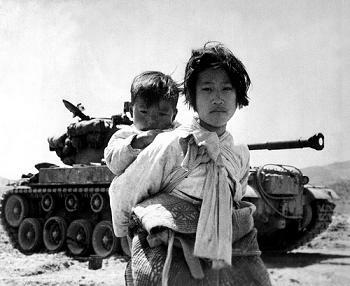 The current exercises being carried out in Korea are the largest ever conducted, involving over 300,000 soldiers, US aircraft carrier battle groups, nuclear submarines, B-2 bombers, Australian naval ships and, to add insult to injury, Japanese forces that attacked and occupied Korea in the Second World War and that helped the Americans to attack the north in 1950. The stated objective of the exercises is to practice Operation Plan 5015, the action plan to kill the Korean leadership, destroy its bases and invade and occupy the country. A first strike using nuclear weapons is a part of that plan. No one denies that North Korea has reason to feel backed into a corner and no one denies that they have the right to defend themselves as Russia and China are doing against the same enemy. Logic and fairness dictate that imposing an economic blockade on North Korea is tantamount to war and that this can only have the effect of making North Korea even more desperate and determined to react. This reaction to the situation in Korea is in stark contrast to the reasoned approach Russia, with Chinese support, has taken in Syria or Russia’s handling of the on-going crisis in Ukraine. It would seem obvious that the best way to reduce tension in Korea is to support North Korea in the same way that Syria has been supported, with some guarantee of its security and a diplomatic initiative to force the Americans to back down and come to terms with the government and people of the country. North Korea has stated time and again that all it wants is to be left alone and to have a peace treaty with the United States and a guarantee that it will not be attacked. Then it is prepared to consider eliminating its nuclear weapons systems. The world breathes a sigh of relief that a peaceful resolution of the war in Syria has shifted from a dream to a distinct possibility but now we face the risk of world war in Asia. North Korea is Asia’s eastern flank. If it is destroyed and its territory occupied by the United States and Japan and other allies, can China and Russia have any doubt what will happen next? It would seem that North Korea is a natural ally of both, but evidently not. Meanwhile, the world watches the American elections and what it sees is a Fellini film in which the most grotesque of humanity vie for power over the military forces now threatening the world. President Obama, the man who won the Nobel Peace Prize, is the same man who ordered the military operations in Korea. This is about as peaceful a leader as we can hope for in that militaristic nation. What comes next will be even worse. Surely, there must be an attempt to bring peace to Korea as in Syria. But for that to take place, the pressure on North Korea must be reduced, and its government treated with respect and dignity. The doors to dialogue must be opened, instead of slammed shut, so reason and goodwill can prevail over the fear and malevolence that now guide the actions of the big powers. In Syria, war turns toward peace but, in Korea, peace is threatened by war. Both have their logic; the logic of peace and war, but the world is weary of the logic of war.